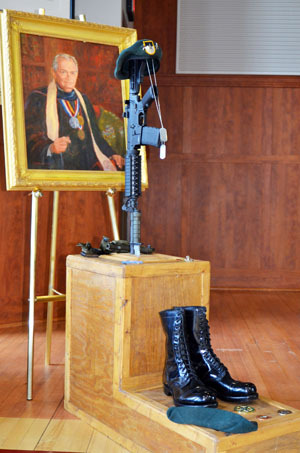 A memorial service honoring Lieutenant General Samuel V. Wilson was held at Hampden-Sydney College on Friday, June 23, 2017, at 1 p.m. in College Church. Gen. Wilson, who passed away on June 10 at the age of 93, served as Hampden-Sydney's president from 1992 to 2000. Rev. M. Keith Leach '81, pastor of College Presbyterian Church and chaplain of Hampden-Sydney College, presided over the service alongside Rev. Dr. William E. Thompson, the retired pastor of College Presbyterian Church and former H-SC chaplain. Mrs. Sandy F. Yeatts sang the national anthem, and Dr. Larry Stimpert, the College's current president, welcomed attendees and family and friends of Gen. Wilson. Scripture readings were offered by M. Peebles Harrison '89, chairman of the College's Board of Trustees, John M. "Jack" Boswell '65, a member of the Board of Advisors for the Wilson Center for Leadership in the Public Interest, and John Z. Axsom '05. Heartfelt eulogies were delivered by Lieutenant General William G. Boykin, U.S. Army, Retired, H-SC Dean of Admissions Anita H. Garland, Dr. Herbert L. "Lee" King '94, H-SC's vice president for institutional advancement, and by Gen. Wilson's son, Lieutenant Colonel Samuel Wilson Jr., U.S. Army, Retired. "Warrior, diplomat, professor, mentor, musician, actor, College president, Sunday school teacher, advisor, counselor, father, husband, friend, and, most of all, true patriot," said Boykin in describing Gen. Wilson. "The story of Sam Wilson is so incredible that many who didn't know him will honestly wonder if this is someone who was created in Hollywood or by a novelist." "He devoted his time, his talents, and his advice to our students, and the rest of us as well," said Dean Garland, who became Hampden-Sydney's dean of admissions in the 1990s. "He became our rock, and that defined his presidency. General Sam was in every way a servant leader. He was indefatigable. No task was beyond him, no person beneath him." "Sam saw his role as the leader of Hampden-Sydney to be much more than the normal leadership tasks given to a president," said Dr. King, who was a student during Gen. Wilson's tenure as president. "He carved a role as the spiritual leader of this campus. In Sam, we students saw a quiet and a humble servant, a man who was more at ease in the daily lives of his students than he was in the boardroom, and a man who deeply cared about every individual in the Hampden-Sydney family." "This man, who earned his letters on the campus of the world, has stepped into the passing ranks of the greatest generation," said Lt. Col. Wilson of his father. "Yet I suspect that in the quiet, hopeful, morning hours on these grounds, as you walk to Settle Hall for breakfast or to early class or to work, he ­- with a respectful nod to the fallen Spartans at Thermopylae, that economy of force that saved the idea of democracy for the future millennium - in his soft southern brogue, just might call out to you: 'Go tell my country, men of Hampden-Sydney and citizens passing by, that here, ever faithful to her sacred values, my spirit lies.'" "Many of us were privileged to know this man as someone who often spoke and who certainly exemplified faith words and moral sensitivities that flowed as naturally from his heart, his mind, and his voice as did the life breaths that this great man rhythmically inhaled and exhaled for 93 years and 252 days," said Rev. Dr. Thompson in a meditation. Chaplain (Colonel) Keith N. Croom of U.S. Army Special Operations Command (USASOC) read the Special Forces Prayer, after which the "Ballad of the Green Beret" was played. Mrs. Susi Wilson, Gen. Wilson's widow, was then presented an American flag by Lieutenant General Kenneth E. Tovo, the commanding general of USASOC. 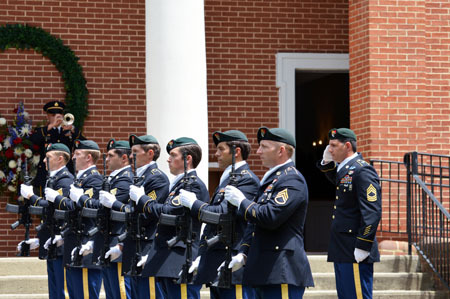 An honor guard comprised of soldiers from USASOC performed a 21-gun salute, and the sounding of "Taps" was performed by Staff Sergeant Brian Hall of the 392nd Army Band at Fort Lee. Hampden-Sydney professors Dr. Kevin Dunn and Dr. Marc Hight performed "Amazing Grace" on bagpipes. In addition to many family and friends of Gen. Wilson and alumni, faculty, and staff of Hampden-Sydney College, attendees included former Hampden-Sydney presidents Josiah Bunting and Christopher Howard, Longwood University President Taylor Reveley IV, and U.S. Marine Corps Lieutenant General Joseph L. Osterman, the deputy commander of U.S. Special Operations Command.